Players are nobles in charge of a growing city, attempting to build it up into the most prestigious population center in the country. You start with a player board and five different dice that represent your city. 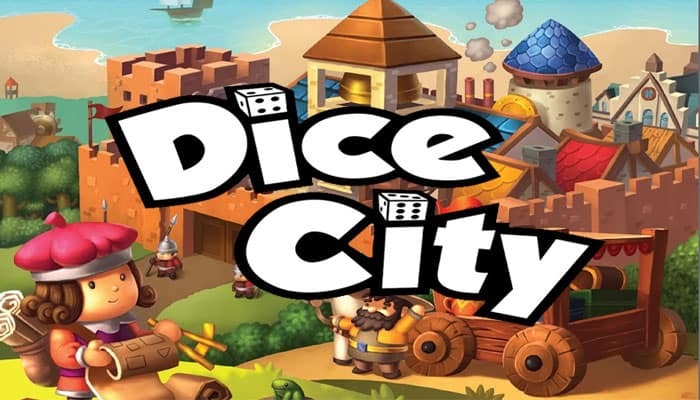 During the game, you use dice to activate locations in order to gather resources, train armies, and build even more grandiose locations. Adding locations, defeating bandits, and exporting goods with trade ships can reward you with victory points (VP). The player with the most VP at the end of the game wins. Location Type: The colored wash on the bottom of the card and symbol indicates which type of location the card is. Locations are classified into five different types: resource (green), military (red), economic (yellow), cultural (purple), and civic (blue). See chart on page 15. Cost: These icons indicate the resources you need to spend in order to build the location. Ability: Most locations trigger their ability when you activate them with a die. Some locations feature an "Ongoing" ability that is always activated after they are built. Some locations may have abilities that activate when you build them. Defense: The number in the shield represents the location's defense. 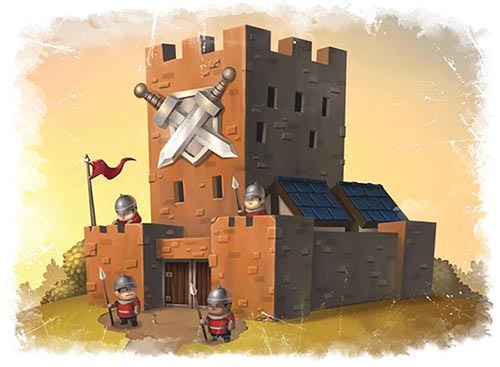 In order for players to attack the location, they need an army strength equal or greater than the defense. The greater the defense number, the more difficult it will be for opponents to attack. VP: This value indicates how many VP the location is worth at the end of the game. Defense: The number in the shield represents the bandits' defense. 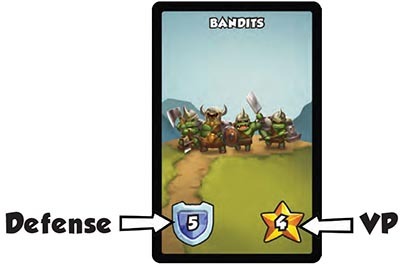 In order for players to attack the Bandit, they need an army strength equal or greater than the defense. VP: This value indicates how many VP the player is awarded after attacking the bandit. Cost: These icons indicate the resources you need to spend in order to export goods. VP: This value indicates how many VP the player is awarded after exporting goods. 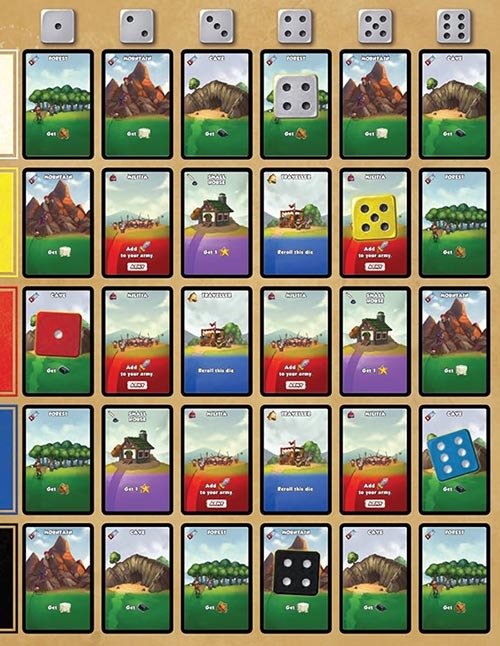 Setup Players: Each player takes a player board and a set of five colored dice (1 white, 1 yellow, 1 red, 1 blue, and 1 black). Return the unused player boards and dice to the box. 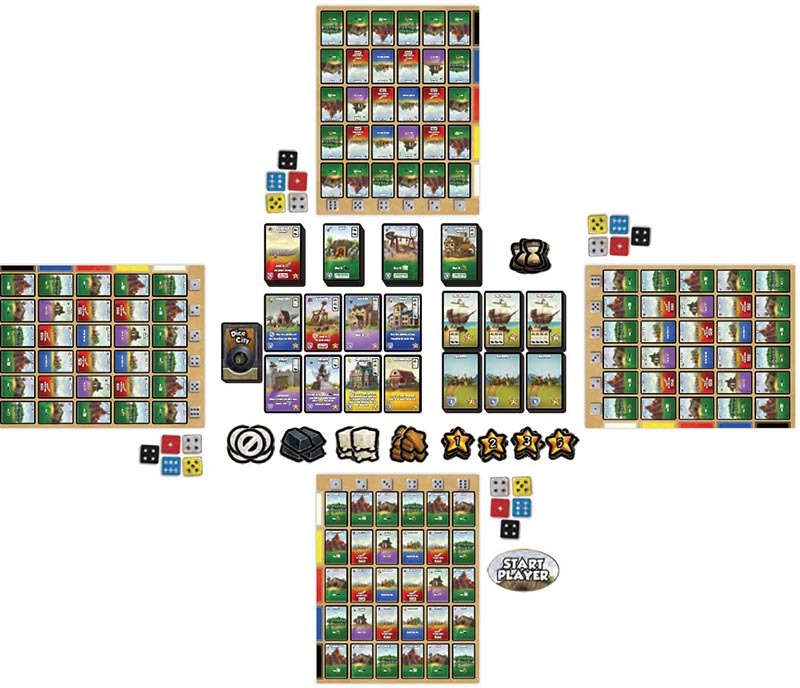 Setup Locations: Separate the Lumber Mill, Quarry, Mine, and Regular Army cards into four individual stacks and place them face-up. These are cards that are always available to build (unless they run out). Shuffle all of the location cards to form a face down location deck next to these card stacks. Then draw eight cards from the deck and place them face-up in a row next to the deck. 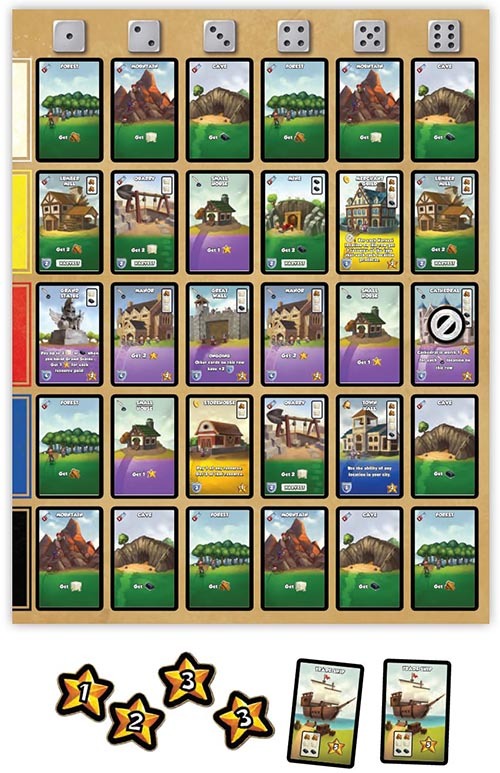 This forms the display of cards that are available for players to build. Setup Bandits: Set up the bandits cards in three piles. Each pile, worth 2, 3 and 4 VP will have a number of cards equal to the total number of players plus 2. Setup Trade Ships: Set up the trade ship cards in three piles. 5 VP trade ships equal to the number of players plus 2, 10 VP trade ship cards equal to the number of players and one 20 VP trade ship card. 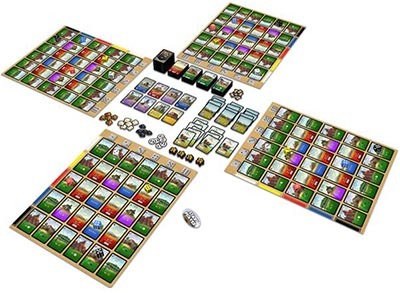 Setup Resources, Pass Tokens, Deactivation Tokens, and VP Supply: Make three piles of the resource tokens (wood, stone, and iron) within easy reach of the players. Place the VP tokens nearby to form a supply. Make separate piles of the Pass M and Deactivation 0 tokens. Determine Starting Player: The player who last rolled a die in a game takes the starting player token. Setup Dice: Each player rolls all of their five dice and assigns them to their location on their player board. For example, if the white die rolls a "3" result, place it on the third space in the white row. The following is an example of a player rolling dice and assigning them to the corresponding spaces of their player board. Note that each color that corresponds to a dice has an associated row. Each number that can be rolled on the dice has an associated column. The starting player takes the first turn of the game. When a player finishes his or her turn, the next player clockwise around the table takes a turn. Players continue taking turns until the end of the game. Use the location beneath the die and resolve its ability. Move another die to an adjacent space on that die's own row. Discard four of the location cards in the display that are available to build and reveal four new ones. Important: You may only take this action once per turn. Reactivate a deactivated location anywhere in your city. Pass and gain a pass token. Important: You may only take this action once per turn. 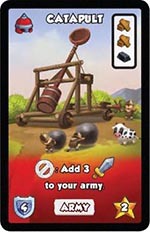 Increase your army strength by +1 for the turn. Force all other players to re-roll one of their dice of your choice (this happens in clockwise order starting from your left). After you use each die, remove it from the location and place it to the side of your player board. When you finish using all of your five dice, this step ends and you proceed to the Attack Step. Each time you use a location that produces one or more resources those resources are added to your stock. Each time that you use a location that generates VP take a VP token from the supply and place it face down in front of you. Some military (red) locations feature a sword icon in their text ability (which may be preceded by a number). These are considered Army locations. When you use such a location, it adds the number of swords to your army strength. Activating additional locations with sword icons adds to your total army's attack strength. Your army strength only lasts for the duration of your turn and automatically returns to zero at the end of your turn. If you have enough army strength from used locations, you may perform one or more attacks during this step. There are three kinds of attacks: attack bandits, attack locations, and attack stock. Choose a bandits card for which you have an army strength equal or greater than its defense and take that bandits card, placing it face down in front of you. If all of the bandits cards in one pile have been taken, then those bandits cannot be attacked. Choose one or more locations on another player's board for which you have an army strength equal or higher than the locations' defense. Then place a deactivation token on each location chosen and gain VP from the supply equal to each location's VP value, placing the tokens face down in front of you. If a location doesn't have VP value (for example the Harvest resource locations), then you simply place a deactivation token on it without gaining any VP. You cannot attack a location that already has a deactivation token. 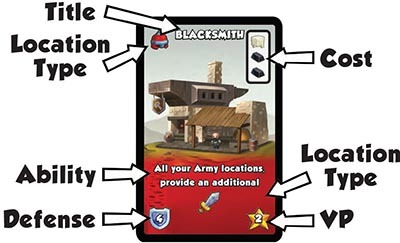 You cannot attack a location that does not have a defense value, such as the starting locations on a player board. Choose another player and take one or more of the player's resources in his or her stock. For each resource, an army strength of 2 is required. For example, if you want to take two resources from a player, you would need an army attack strength of 4 or more. Your army strength is spent after each attack. However, if there is still enough army strength from your remaining total left after each individual attack, you may use it to perform additional attacks. For example, if you manage to gather an army strength of 8 during a turn, you may use 3 strength to attack a bandit, 3 strength to attack another player's location, and 2 strength to attack a player's stock and take a resource. You may attack the same player multiple times during a turn, or attack different players as long as you have enough army strength to do so. You may build new locations in your city from those available in the display. Choose a location and spend resources from your stock, according to the location's cost. Spent resources are returned to their supply piles. Then take the newly built location and place it anywhere on your player board. You may even place the new location on top of another card. However, only the top card is considered in play - discard the previous location card. After a location is built, immediately draw a card from the top of the location deck and add it to the display face-up. You may build as many locations as you have resources for; there is no limit to the number of locations you may build during your turn. During this step, you may also use trade ships to export goods in order to gain VP. Choose a trade ship and spend your resources according to the trade ship's cost. Spent resources are returned to their supply piles. Then take that trade ship card and place it face down in front of you. 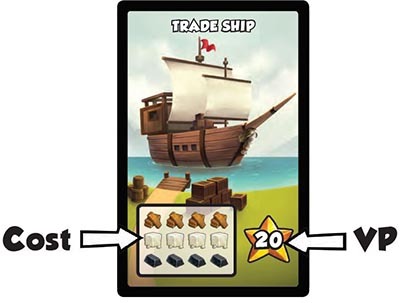 For example, if you export goods on the trade ship that requires 2 wood, 2 stone, and 2 iron, you would take a 5 VP trade ship card. If all of one value of trade ship cards has been taken, the players can no longer use that trade ship. If you have any resources remaining, you may store one of each type, i.e., one wood, one stone, one iron. The resources are considered to be in stock. Any resources not stored are returned to their piles. You may keep any number of pass tokens - there is no limit to the number of pass tokens you may have. Note that pass tokens are not considered to be in stock; only resources are kept in stock. Then roll all of your dice and assign them to their place on your player board (see "Assigning Dice" on page 9). At the end of your turn, your army strength reverts to zero. Then the next player clockwise around the table takes a turn. Pass tokens, resource tokens, deactivation tokens, and VP tokens are considered infinite. There is plenty of each in the game to cover most circumstances, but if for any reason you run out, you should use proxies if players require to access additional tokens. All of the cards have been taken from all three of the bandits piles. All of the cards have been taken on two or more trade ship piles. The location deck runs out of cards. Two or more rows in a player's city have been filled with built locations and none of them have any deactivation tokens (optional - the player that meets this condition chooses if he or she wishes the game to end or not). When one of the conditions is met, the players continue until everyone has had an equal number of turns. 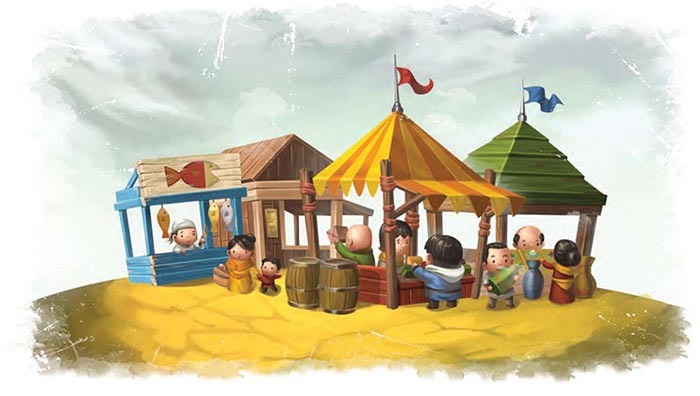 When the final round ends, each player counts the VP tokens they have in front of them and the VP from the trade ship and bandits cards they have taken, and adds the VP values of all the locations in their city, both active and deactivated. Locations that have been discarded by building other locations on top of them are not considered to be part of the city any more so they do not count towards scoring. The player with the most VP wins the game! In case of ties, the player with the most location cards in his or her city wins. If there is still a tie, the player with the most VP from trade ships and bandits wins. If there is still a tie, closest to the starting player wins. Angela, the last player in the game, has just ended the game by defeating the final bandits card. Charles is now ready to add up his VP total. Charles has pursued a much more pacifistic approach to winning the game, combining some trade with a magnificent central row in his city. First, Charles looks at his trade ships. He has managed to secure two of the 5 VP ships. In addition, he has secured a total of 9 VP from his Manor, Small Houses and from an extra stone and iron resource that he paid when he erected his Grand Statue. With his early commitment to an economic and cultural strategy, Charles has not secured any VP from bandits leaving that to Angela and Beth. With a total of 19 VP from tokens and cards, it is now time for Charles to add in his major source of VP - his built locations. The Harvest locations, whilst being very useful to his strategy do not gain any VP. However his economic and civic buildings have not only helped his strategy, but add a total of 7 VP (3, 3 and 1 respectively for the Town Hall, Merchant Guild and Storehouse). However, his red row is going to score most heavily for him. The Statue, Manor, Wall and second Manor score 2, 2, 3 and 2 VP. Although the Small House is worth no VP, it is still a cultural location and so does add to the value of the Cathedral, which will score even though it was deactivated in an earlier attack from Beth. The magnificent Cathedral is therefore worth 6 VP, meaning that his red row is worth a total of 15 VP. His final total is therefore 41 VP - 10 from trade ships, 9 from activated abilities in the game and 22 from locations built. A good score!